Where is the 5th Division? The 5th Division includes Eastern Washington, Northern Idaho, Montana, and Northeast Oregon. 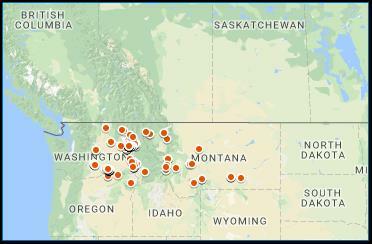 The principal cities are Wenatchee WA, Spokane WA, Lewiston ID, Billings MT, Missoula MT, Helena, MT, Pendleton OR, Yakima, WA, and the Tri Cities (Richland, Kennewick, and Pasco WA). The maps below show the locations of our members as of January 2018. Thanks for stopping by to see!!! Banner Bank Mtg. Rm., 203 W. 1st St.